We met in 2005 through our joint love of music and got together in the summer of that year. When we first saw one another it was one of those ‘bolt of lightning’ moments that you only read about or see in a film. It really can happen – and for us it was love at first sight. When we’d been together for nine years we decided to get married. It was very much a joint decision in the summer of 2014 and the announcement led to much excitement all round! We chose to tie the knot on 2 August 2016 – the exact same date that we’d got together 11 years earlier. We both have similar tastes so going through the process of planning our day was something that we both really enjoyed. We wanted an exclusive venue that was both intimate and stylish – but most importantly, we wanted it to be a day full of love, with our closest family and friends there to celebrate with us. We chose orange as a theme for our wedding. Our guests were all asked to wear a splash of orange and the best woman and bridal party had either orange shoulder corsages or orange cravats. Needless to say, our guests took the instruction very seriously and brought a vibrant colour palate to our pictures! We wanted our wedding to have an exclusive ‘celebrity’ atmosphere, so we chose two venues, both owned by the same hotel group, so we could be confident of their privacy and quality. Both venues were stunning, and nestling in Constable country, Essex, they gave us the perfect blend that we wanted. Our ceremony took place at Maison Talbooth, a beautiful 14-bedroom manor house, where our immediate family and closest friends stayed with us. Then a luxury coach took our 50 guests to the next venue, Le Talbooth, for our wedding breakfast. As our guests nibbled on the most exquisite canapés by the river, we surprised them by arriving by boat. We had been whisked away from the ceremony in a chauffeur-driven Bentley (complete with a much-needed ice cold bottle of Veuve Clicquot!) and taken to Stratford St Mary, where we sailed up the river to our wedding party. Wanting some splashes of tradition throughout the day, we both decided to wear ivory and cream. We knew from the start that it would be a dress and trouser suit combination so the challenge was to find what we wanted. We were always fairly relaxed about this aspect and we loved our outfits – as did everyone else. We loved choosing the music for our ceremony. We walked in to Christina Perri’s A Thousand Years, as the lyrics were really important to us. Luther Vandross’s Here and Now played when we signed the register, and then Forever by the Brand New Heavies drifted across a room charged with positive emotion. 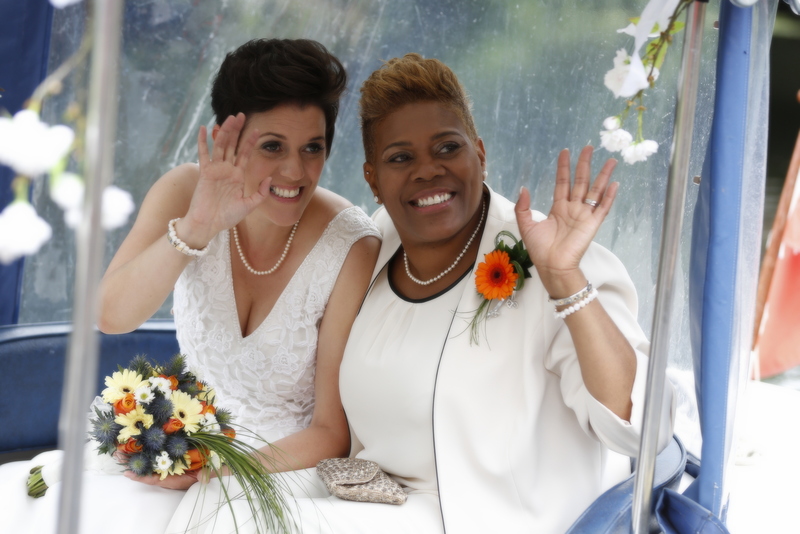 As everyone stood to welcome us as the happy couple – ‘Fay and Michelle Greaves-Hughes’ – we walked out in style to Cheryl Lynn’s Got to Be Real. Our bridal party was made up of our family and closest friends. Our best women – Michelle’s sister and Fay’s best friend – walked in first as the music began. As they took their places at the front, Fay walked in accompanied by one of our closest friends, Jonathan, and emotions were already running high. Michelle came in last with her dad, and the wedding party was responsible for ensuring that we were both shedding tears of joy by the time we reached the registrar! Our ceremony was formal as far as the vows were concerned, and we asked friends and family to read poems that were meaningful to both of us. There were two parts to our reception – the formal wedding breakfast at Le Talbooth and the evening reception at the Maison Talbooth. As all guests had three starters, three mains and three puddings to choose from initially, the fact that everyone got what they had ordered felt like a magnificent achievement on our part! The food was simply stunning, as were the wine and champagne for toasts. The afternoon was a real box of delights, with a wide range of speeches and tears of joy, genuine hysteria and live musical medleys against the beautiful setting. The wedding breakfast ended in the loveliest way with a live version – complete with family musicians – of All You Need is Love. As our wedding guests sang and harmonies floated into a hazy summer evening, we quietly slipped into the Bentley to get ready for our evening guests. As our day guests returned to Maison Talbooth to relax in the garden or continue to party in the Pool House, we took a much-needed five-minute breather to freshen up before our evening guests arrived. We wanted to make sure that our additional guests felt part of the whole day so ensured they were served with a glass of champagne on arrival as they were serenaded by our live singer Irie J. Pretty soon the house was alive with everything you would expect at a wedding party. We did have a few more surprises for our guests though, including a secret pre-wedding video and our Strictly inspired wedding dance – a cha-cha-cha to Lisa Stansfield is no easy task we can tell you! We had weeks of secret dance lessons and loved every minute – and it was worth it as the guests seemed to love it even more! Our guests were very emotional, both on the day and after the day – for quite some time! Everyone who came said that this was the best wedding they had ever been to. 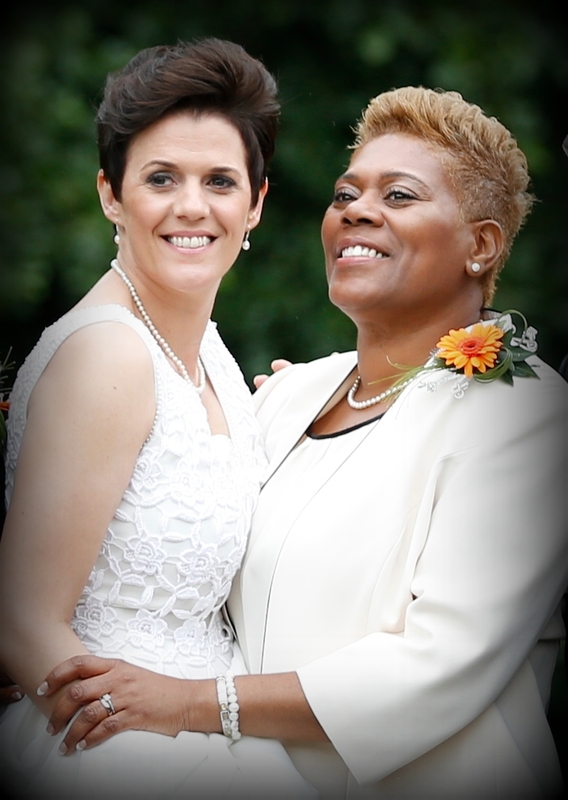 They commented on the amount of love we have for each other, the atmosphere on the day and many said, ‘can we do it all again next year please?’ There was something for everyone – and for us the day was also about bringing our special people together to celebrate our relationship.